A lot of baseball remains to be played. If we continue on our current track, the last seven games will loom big, facing OSU and ASU in six of those. Unfortunately, the last 3 of those against ASU are on the road. They will present a great opportunity to show if we really have what it takes this year to win big games. Arizona State will be a match up of strengths. They can hit, particularly big (55 homers), while Stanford leads the nation in fewest home runs allowed (6). We will try to force them into going a base at a time. Oregon State's staff, comparable to ours, held them to 11 runs in the series in Tempe. Meanwhile, the Devils don't pitch well (3.98 ERA), and we have five guys who can take a miss deep, especially in ASU's warm and drier air. The Devilss big numbers on offense partly reflect their puny opposition; their non conference schedule ranks 221st in the country. Stanford should win the series. This is just a pet peeve of mine, but I don't think any of the other UC schools go by Cal. Well, except for UC Davis when they refer to the Cal Aggie band or the Cal Aggie Alumni Association. But for the most part they too stick to UC Davis. I just tuned in and Tawa boomed a 3 run homer. Now 6-8 in the 8th. There's a chance. (04-16-2019, 06:47 AM)Hulk01 Wrote: Notable: Cal Santa Barbara #7 in Collegiate Baseball and #8 in Baseball America. As an 18+ year employee of UC Santa Barbara, I concur. Cal as a prefix, if it's used, usually goes with a member of the California State University system (as opposed to the University of California). So Cal State Fullerton, Cal State Channel Islands are OK. Even then, CSU or just the location+state (e.g. San Diego State) would be more common, I think. That's right. The CSU schools do sometimes use Cal State as a prefix in their shortened names, but they don't all do it. The CSU system is much less uniform than the UC system when it comes to campus names. 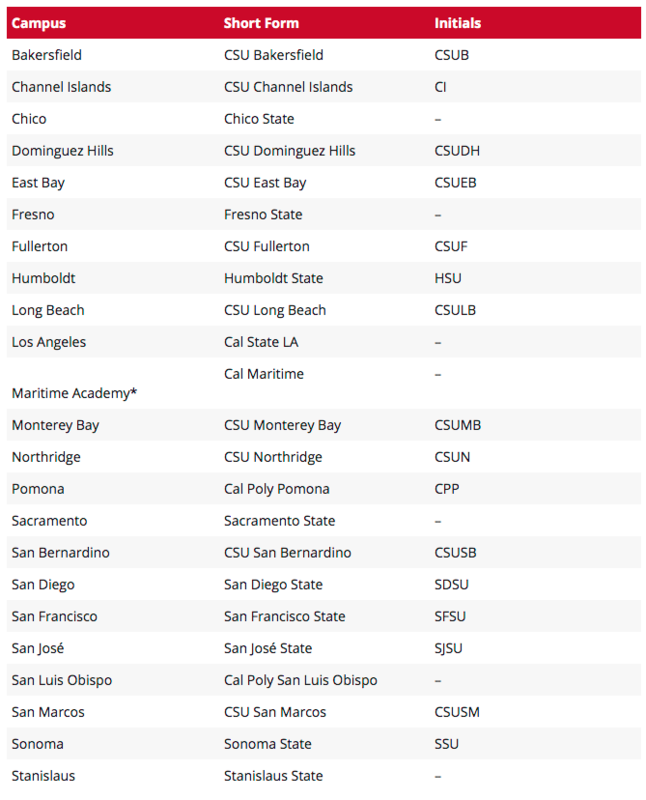 Even though Cal State LA appears to be the only campus that formally embraces the "Cal State [city]" name, I think that it's common to refer to the campuses at Fullerton, East Bay, Northridge, Dominguez Hills, San Bernardino, Bakersfield, San Marcos, and Long Beach that way too. In the case of Long Beach, however, it's only one of their many short name forms and they seem to prefer Long Beach State or The Beach for athletics. This one has Stanford hosting Navy, Fresno State, and Auburn. That one has Stanford as the #6 overall seed. Baseball America has Stanford as the overall #2 seed. Their rankings have UCLA #1, Stanford #2, OSU #5. This week's series up at UO will have a bigger impact on how all this changes next week than does the midweek loss to Davis. Bottom line: the team HAS to play better. Stanford has too much talent to scuffle as it has. I want one weekend where the hitting, pitching and defense all perform at a high level and the bats (including my kid) get it done 1 through 9. I'd like no more gaffes on the base paths (the players are too smart for that), the coaches to be a little less conservative and the players to let their talent flow. All of the close games and the inexplicable loss to Davis are stressing me out! (04-18-2019, 10:21 AM)Mr. Baseball Wrote: Bottom line: the team HAS to play better. Stanford has too much talent to scuffle as it has. I want one weekend where the hitting, pitching and defense all perform at a high level and the bats (including my kid) get it done 1 through 9. I'd like no more gaffes on the base paths (the players are too smart for that), the coaches to be a little less conservative and the players to let their talent flow. All of the close games and the inexplicable loss to Davis are stressing me out! Well, if you are a parent then you will have a different perspective on the team than others here. But, it is good for the blood pressure to remember that this is baseball, and a single game is much more random in outcome than most sports. For example, UCLA is a very good looking, unanimous #1 team right now. They have also lost to Sacramento State, Michigan and had a host of close calls. - finding a game two starter. - consistency in getting on base. And the bullpen overall has been very good, but I worry a bit about Grech and Williams just lately. The choice of Oregon State is idiotic. Do the voters know that Kevin Abel is out for the season? (04-18-2019, 01:37 PM)Hulk01 Wrote: The choice of Oregon State is idiotic. Well, Abel has only appeared in three games this season, his last on March 1 vs West Virginia. Since that series OSU has gone 15-7-1, which isn't quite lights out but isn't terrible. The only weekend series they lost was losing 2 of 3 versus UCLA. They also took a series at Tempe (well, actually at Phoenix). I'm not sure that should get them to #2, but it's not bad. CT, I don't think Oregon State is bad. and Jones (.649 OPS), Taylor (.284! ), Armstrong (.460) and Malone (.605) can't hit. or even the third, fourth, or fifth best team. There is no basis for picking them as the overall #2 seed. First off, I had missed that the weekend series were all moved up to Thursday through Saturday to give an Easter break. Stanford took a tough 5-4 win last night up in Eugene behind two homers from Wulff and another from Kinamon. (04-18-2019, 03:59 PM)Hulk01 Wrote: CT, I don't think Oregon State is bad. I don't think we really disagree all that much. I think the humans are overrating OSU a bit based on past years' success - and perhaps preseason expectations. OSU has some holes that their recent teams did not, and I sure hope that Stanford can exploit those. Nonetheless, OSU has some pretty impressive credentials on their season, providing at least a basis for thinking OSU might be a top 5 team. They have played, and mostly succeeded, against a tough schedule. Some of their highlights include a four game sweep of Nebraska at a neutral site (21-11, RPI #33, leads Big Ten), a series win vs WVU (22-13, RPI #14), and a road series win against ASU. Boyd Nation has them with the toughest schedule in the country so far. I am not able to give my own personal ranking of where the Beavs (or Stanford for that matter) ought to be ranked. I just haven't watched enough non-Pac 12 baseball this year. OSU is clearly in the top 3 in the Pac, well really in the 2 or 3 slot. While I think Stanford has a higher ceiling this year I am not sure Stanford has performed better than OSU so far.